I’ve been through every submission to the Climate Change Authority review of the Renewable Energy Target (RET), and categorized them by their recommendations (background on the review here). “Increase” = increase the 2020 Large-scale Renewable Energy Target (LRET). This category includes recommendations that the Government recognize the urgency of climate action, set targets of up to 100% renewable energy by 2020, make complementary policies and voluntary action additional to the RET, replace the present Renewable Energy Certificate scheme with a feed-in tariff, and/or limit the scope of future reviews to strengthening the RET. My submission (here, with commentary here) falls into this category. “Strengthen without changing 2020 target” = strengthen the RET without necessarily increasing the 2020 LRET. This category includes calls to increase targets beyond 2020, make Clean Energy Finance Corporation (CEFC) investments additional to the LRET, revise the trajectory so it goes up each year, index the shortfall charge, and/or improve the Small-scale Renewable Energy Scheme (SRES). 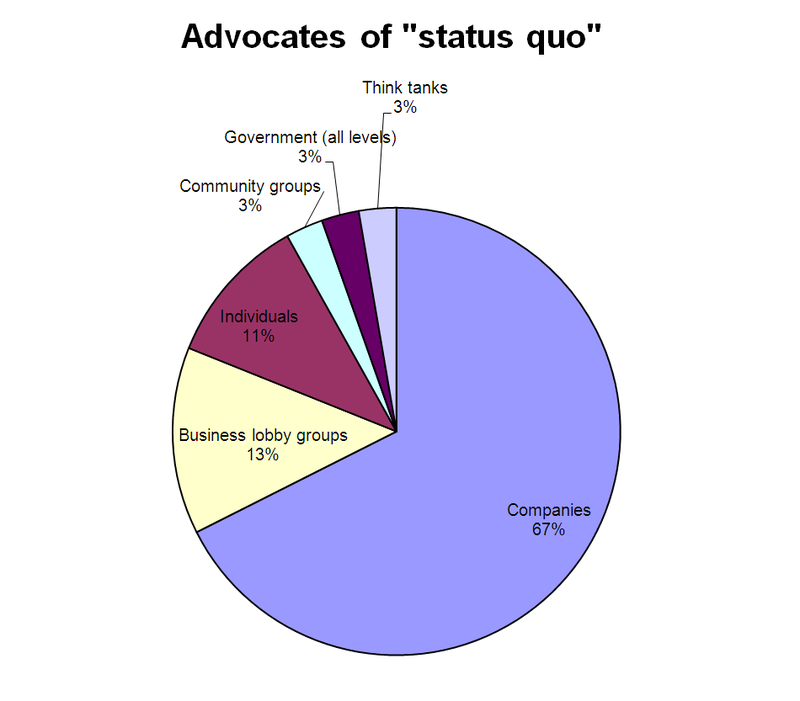 “Status quo” = no change. Usually the justification given for this recommendation is to give investors certainty. “Weaken” = weaken the RET, usually enough to significantly sabotage the policy goal. This category includes proposals to adjust the LRET to lower demand forecasts, abolish or cap the SRES, reduce the solar multiplier to less than 1, expand the definition of “renewable energy” to include low-emissions technologies or carbon capture and storage, link to international renewable energy targets, phase out the RET after 2020, and/or abolish state-level renewable energy policies. 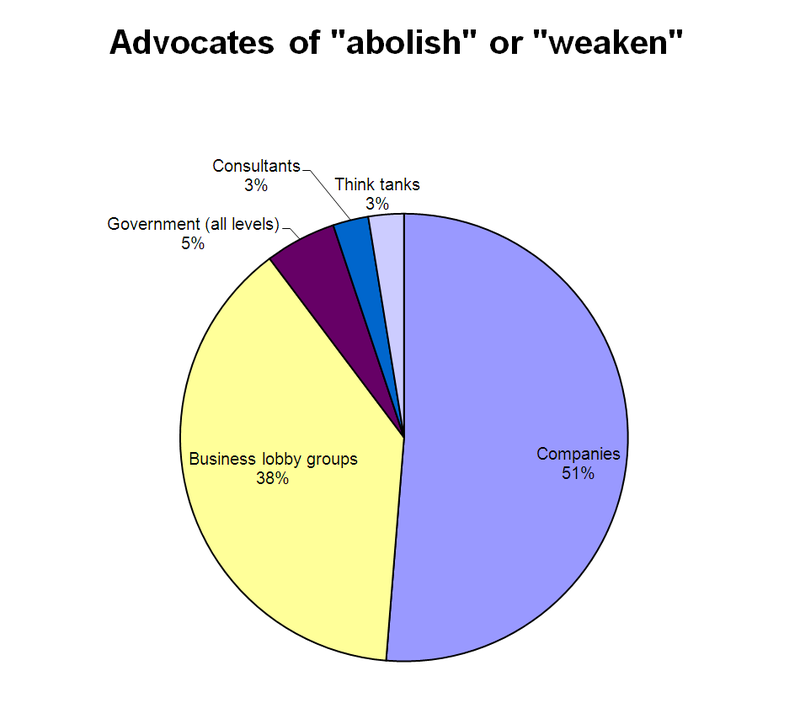 “Abolish” = terminate or phase out the RET. The typical justifications were that the carbon price makes the RET redundant, that the RET is inefficient and costs consumers, and/or that it should be replaced with funding for R&D. “Other” = does not quite fit into any of my categories. Submissions in this category may advocate particular technologies, may communicate pertinent facts or discuss issues without making specific recommendations, may be too technical for me to judge, or may just be plain incomprehensible. My classification may not be entirely consistent, as I fine-tuned the criteria as I went. The lines between categories are somewhat blurry, and some submissions were borderline. I read long submissions for the general tone and recommendations, so I may have missed some nuances. 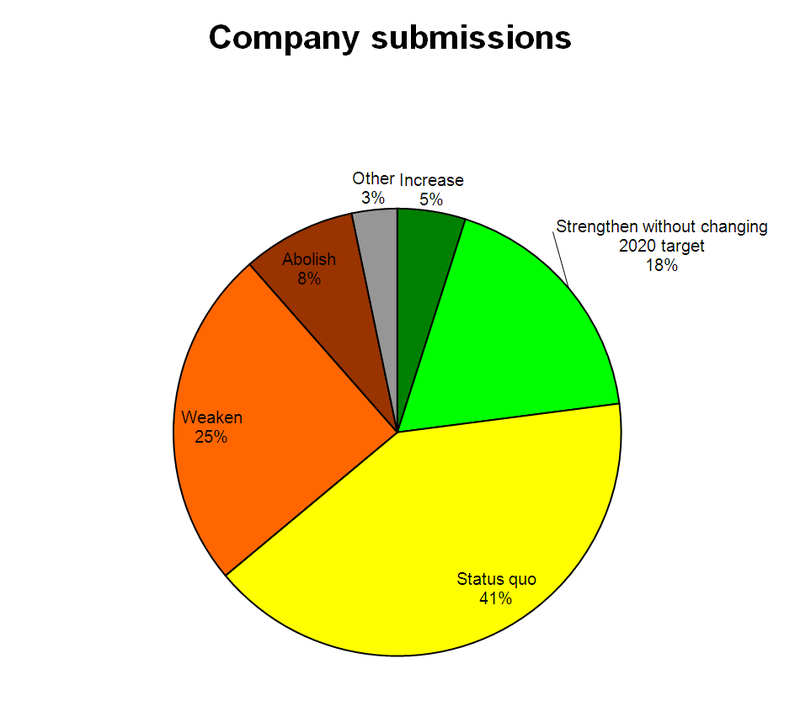 “Strengthen” is a very broad category covering the grey areas between “increase” and “status quo” – many submissions in this category have a strong “status quo” vibe, while others have more of an “increase” vibe. Some submissions in the “status quo” and “weaken” categories support the positive step of excluding waste coal mine gas (WCMG, as noted in the list at the bottom of this post). Many submissions in the “abolish” and “weaken” categories canvassed phasing out the RET over time; generally I have distinguished based on whether the submitter acknowledged inherent value in a RET. A few submissions argued that the RET should be partly or wholly replaced with a different mechanism; they were difficult to categorize. While you could quibble with the categorization of individual submissions, my analysis should be accurate enough for a general overview. A grand total of almost 8,700 submissions were received, including those from supporters of the GetUp! campaign to increase the 2020 target (~7,800), and the campaign by community-owned renewable energy generator Hepburn Wind for a post-2020 target (~700). If these are counted as 8,500 individual submissions, then the overwhelming majority of submissions support increasing the RET. My analysis in this post counts each of these campaigns as a single submission by a community group, meaning there were 157 unique submissions (excluding any confidential ones). 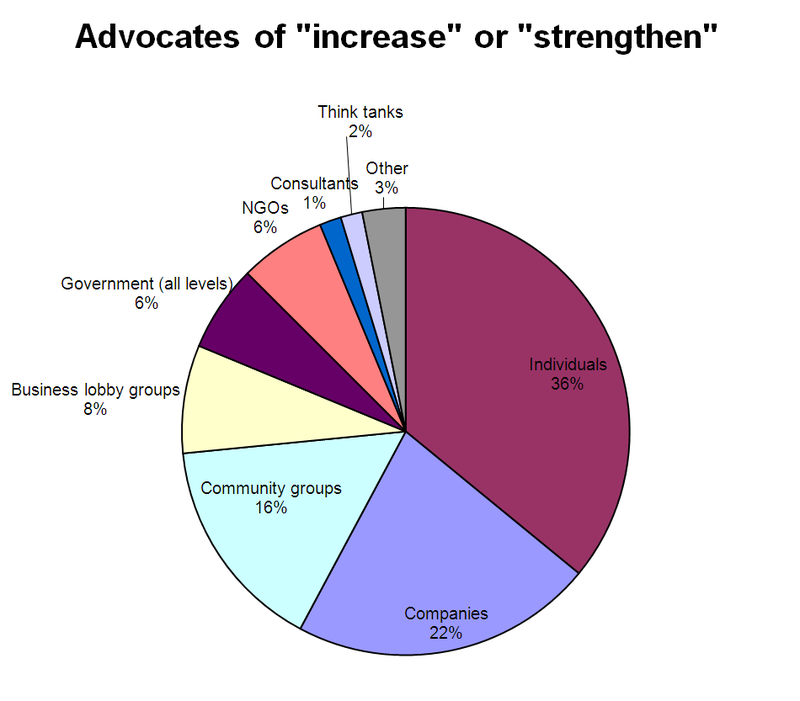 As shown in the image above, about two thirds of the 157 submissions support a RET at least as strong as the one in place. Of those who advocate changing the RET, nearly twice as many want to increase or strengthen the RET than abolish or weaken it. But what I find more interesting is who said what. 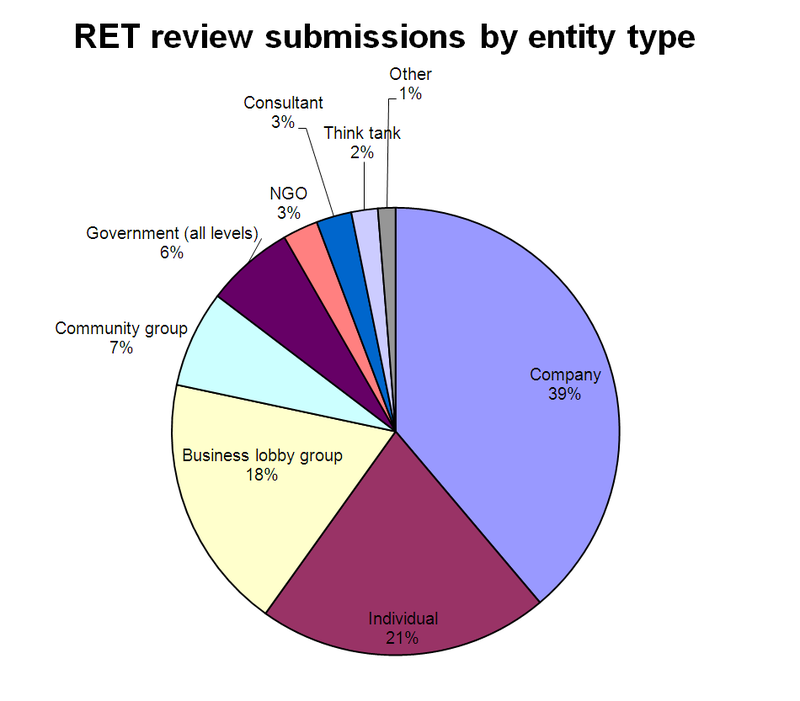 Who made submissions to the RET review? About two fifths were companies, a fifth were individuals, a fifth were business lobby groups, and the remaining fifth were a diverse array of community groups, government, non-governmental organizations, consultants, think tanks, and others. 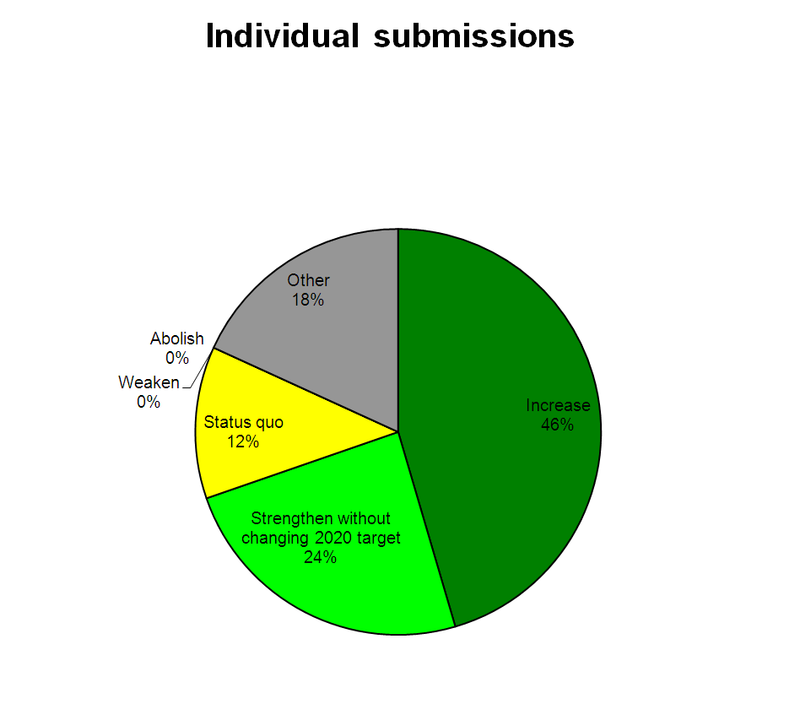 35% of business lobby group submissions advocate abolishing the RET, compared with just 11% of all submissions. 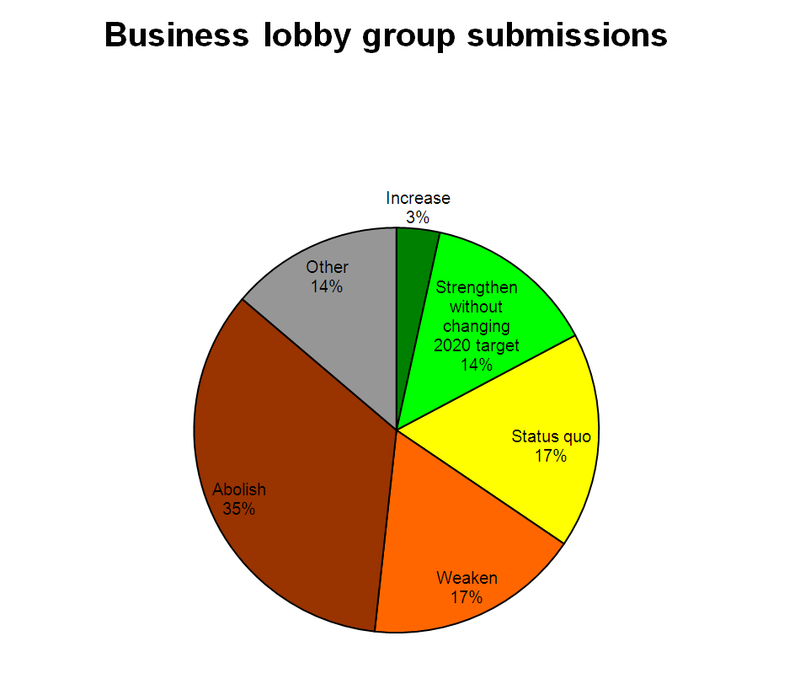 A mere 3% of business lobby group submissions advocate increasing the RET, compared with 21% of all submissions. Clearly business lobby groups do not represent the broader community. Probably the most important opponent of the RET is the Australian Industry Greenhouse Network (AIGN, whose submission, incidentally, was made a week after the closing date). AIGN argued that the RET is inefficient, costs consumers, and is made redundant by the carbon price. This is part of an ongoing campaign by AIGN, other business lobby groups, and the Productivity Commission to dismantle all non-carbon-price climate policies. I anticipated and debunked their main arguments in my submission. Eight other business lobby groups (Australian Forest Products Association, Australian Industry Group, Cement Industry Federation, Australian Aluminium Council, Australian Coal Association, Minerals Council of Australia, Australian Petroleum Production & Exploration Association, and National Generators Forum) and six companies (Qenos, Origin Energy, Chevron, International Power, Stanwell Corporation, and Rio Tinto) in the “abolish” and “weaken” categories are members of AIGN; some explicitly endorse the AIGN submission. The argument is taken to a ridiculous extreme by the Minerals Council of Australia, whose submission simultaneously argues the RET should be abolished because it is made redundant by the carbon price, and the carbon price should be repealed! Other business lobby groups who made similar arguments include the National Farmers Federation, Major Energy Users, the Chamber of Minerals and Energy of Western Australia, and Business Council of Australia. As expected, electricity generator-retailers Origin Energy and TRUenergy argued the RET should be reduced to account for revised demand projections, which would effectively cause renewable energy deployment in Australia to stop completely in 2016. This argument was also debunked in my submission. The same argument was made by several other fossil fuel electricity generators – EnviroGen, International Power, Ergon Energy, Alinta Energy, Power and Water Corporation, Stanwell Corporation – as well as the Energy Supply Association of Australia and National Generators Forum. They complain about alleged costs to electricity consumers, but Alinta Energy, owner of Port Augusta’s brown-coal-fired power plants, explicitly revealed the generators’ true reason for concern: “Existing non-renewables should not be stranded as a consequence of the Renewable Energy Target”. Another interesting submission was from the Government’s climate change advisor Ross Garnaut. He argued, as usual, that Australia’s role is to cut its emissions by its fair share (which Garnaut believes is 5-25% by 2020) at least cost to our economy, that a carbon price is the cheapest way of doing this, and that therefore the Government should allow the RET to become redundant over time. (I wish I’d pointed the Climate Change Authority to the recent Laggard to Leader report by Beyond Zero Emissions, which puts forward what I believe is a more constructive view of Australia’s role: Australia should use every lever at its disposal to accelerate climate action, including though not limited to decarbonizing our domestic economy as rapidly as possible.) 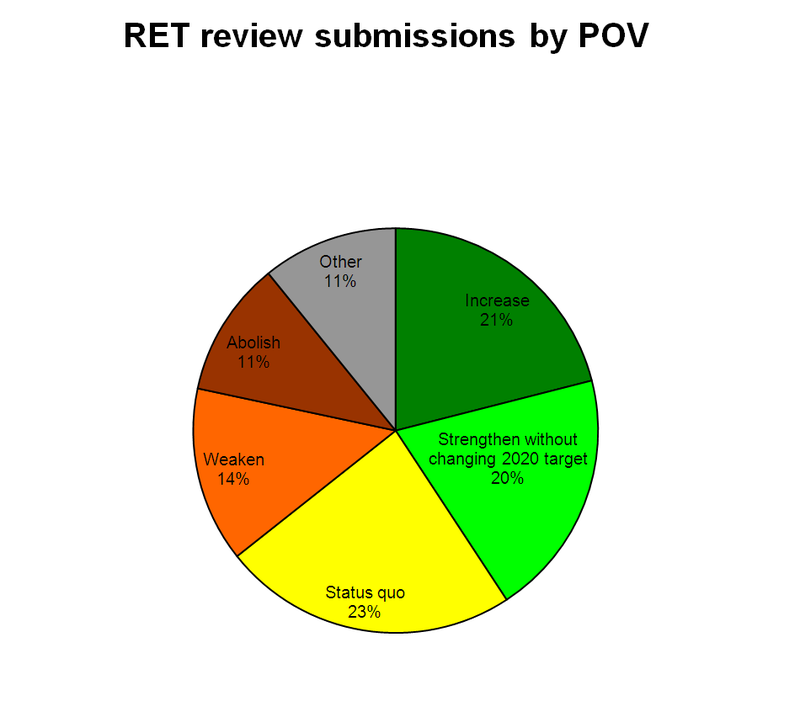 Nevertheless, Garnaut’s submission does support retaining the RET in its current form, so I have put him in the “status quo” category. Probably the most important advocate of the status quo is the Clean Energy Council (CEC), whose submission was endorsed and emulated by a large number of renewable energy companies. CEC argued that any changes to the RET, even if they would hypothetically be improvements, could undermine investor confidence; and argued against scheduled future reviews for the same reason. I had anticipated this argument but didn’t directly address it in my submission; it’s turned out to be so popular I wish I had. I understand where CEC is coming from, considering the “boom-bust cycles” that have resulted from inconsistent renewable energy policy to date. But I think arguing for the status quo is misguided for two reasons: 1) the urgency of rapid decarbonization means 20% by 2020 is too low, and 2) advocating for the status quo shifts the political centre toward those who want to weaken climate policies. The aforementioned campaigns by GetUp! and Hepburn Wind, climate action and environmental groups, solar industry lobby groups, a few companies, some local councils, and most individuals including myself, advocated increasing or strengthening the RET. If the Climate Change Authority recommends abolishing or weakening the RET, it will be yet another triumph of the privileged few whose short-term self-interest depends on trashing the world. I hope this response isn’t too late. I’d say the best-argued submissions for increasing or strengthening the RET are from Beyond Zero Emissions, Australian Conservation Foundation, Australian Solar Council, and of course I like my own submission. The best-argued submissions for the status quo are from the Clean Energy Council and Ross Garnaut. And the most important submissions for weakening or abolishing the RET are from the Australian Industry Greenhouse Network, TRUenergy, Origin Energy, Alinta Energy, and the Grattan Institute. If I was asked to predict the final recommendations of the review, I would guess they will broadly be along the lines mentioned above. The Australian Industry Group advocates reducing the multiplier for small-scale technologies to less than 1. That sounds like weakening to me. Also, though not directly related to the RET, AIG argues for the removal of state-level renewable energy policies.